Last year, I took a number of vacations which involved cruising, diving, snorkelling and walking on glaciers. Thinking back on those trips, I could not help but notice that water and ice exhibited different colours in different settings. I decided to dive deeper into the colours of water. Finally, here are my findings. The colour of an object mainly depends on the colour of light emitted from it. In the case of water its colour is also affected by factors like light source, absorption, scattering, and suspended materials. Absorption by water is stronger for red light, but weaker for blue light. 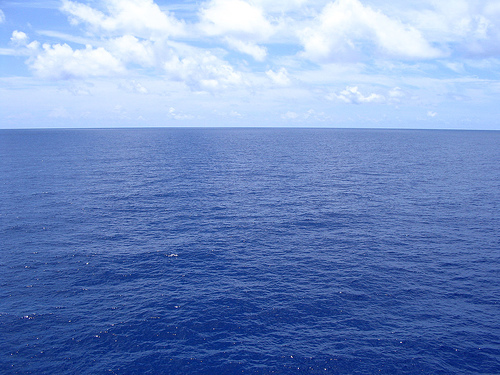 Water is therefore, intrinsically blue. However, this effect is only apparent when the water is reasonably deep. This is why a glass of water appears colourless whereas a big aquarium looks bluish through the thickness of water. I did two cruises last year, one in the Caribbean and the other in the South Pacific. Owing to the depth of the water, these seas and oceans looked navy blue from the cruise ships! 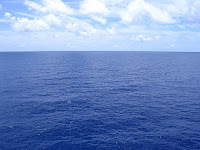 Some would also argue that the sea appears blue under a clear sky because the blue light from the sky is reflected by the water surface. In my diving and snorkeling excursions off the cruise ships, the underwater world was often revealed behind a tint of blue. As it turns out, absorption is the most important factor affecting the colour seen under the water. Red light becomes weaker with depth because it is most easily absorbed. Beneath the surface, water also scatters blue light. Thus we see the greenish-blue effect depending on the depth. As we go deeper, we will see more blue as the greenish colours from the penetrating light rays are absorbed. The overall light intensity also decreases and there comes a depth when it is pitch black. When taking pictures under water, be sure to use a flash so that the subject’s true colours can be captured. The colour of water is also affected by what it contains. Suspended materials affect the colour of water. Sea water will appear green when it contains large amounts of green algae. Muddy water has a brownish yellow tinge. When I was in New Zealand’s South Island, I found that most of the lakes are aquamarine rather than blue. These lakes were largely formed due to glacial actions millions of years ago. The fine powders produced when glaciers grind over rocks during descent were so fine that they were suspended in these waters. These powders are great at scattering light and sending it back to the surface, making the water as a whole brighter. Furthermore, as these particles are everywhere in the water, it takes a shorter distance for the light to be scattered and leave the water. Absorption of red light is thus less, shifting the original blue colour towards green. Thin layers of ice and snow reflect light quite thoroughly, hence often appearing white. When walking on Franz Josef Glacier in New Zealand, I noticed that the ice was blue. Like water, light is scattered and absorbed in thick ice. The longer the path light follows to reach the surface, the bluer the tint. The purity and age of the ice also play an important factor in the colour of glacial ice. As the ice ages it is compressed, melted and frozen again eliminating air bubbles that scatter the light rays and bounce them back out in the same white colour they entered. Once the ice becomes pure the light waves are much more likely to be absorbed, hence, promoting the deep blue shade. In perspective of the current help the Ministry of Education, Science and Technology (MEST) to set up proficiency measures CENTRAL KENYA in school this circumstance has demonstrated baffling as instructors don't realize how to all the more likely help understudies to accomplish this objective. I read this article. I think You put a lot of effort to create this article. the scholars homeI appreciate your work.